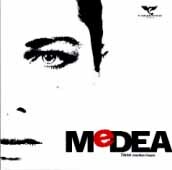 A score written for Fljugandi Fiskar's multimedia production of Medea first performed in Reykjavik on 17 November 2000. Directed by Icelandic film director Hilmar Oddsson this acclaimed production toured to London (ICA), Nottingham and Finland (Tampere International Theatre Festival) in the summer of 2002. Each of the choruses in the Euripedes play is sung in Icelandic by multi-tracked voices accompanied by a three-screen video projection. The music was described as "never less than magnificent" by the leading Icelandic daily paper.